From the architect. The Town River is located at the south of urban core commercial pedestrian street, and it is started from Gudu Harbour on the east and extended to Gangcheng Boulevard on the west with an overall length of more than 2,200 meters and average river width of almost 12 meters. Since the early 1990s, due to the situation that nearly half of the river was covered by house and the rain sewage directly discharged into the river, and unable to implement river dredging throughout the year, the river water quality was seriously polluted; for the surrounding area of Town River, the environment was in a mess, and the traffic was congested and the buildings were old and shabby. 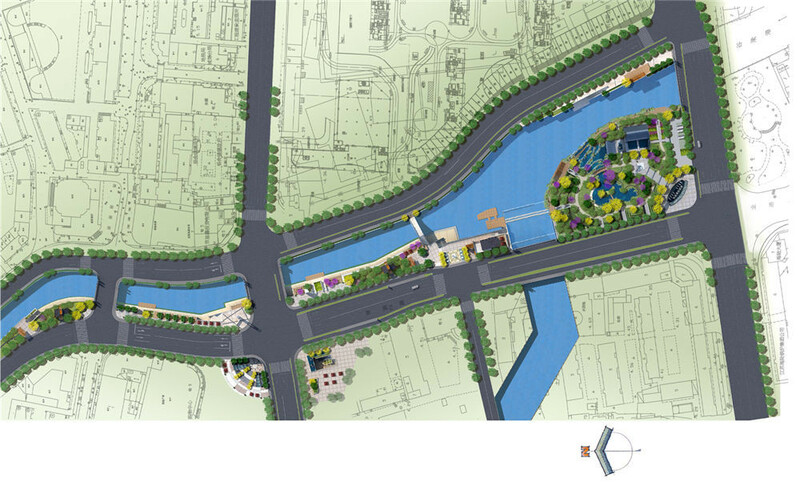 The comprehensive reconstruction of Town River is based on the concept of creating the “City Parlour” of core commercial area and trying to implement the pollution control and water import meanwhile recover the natural ecology of the river; construct the landscape meanwhile provide a more pleasant environment; implement comprehensive improvement meanwhile improve infrastructure functions of the entire region. 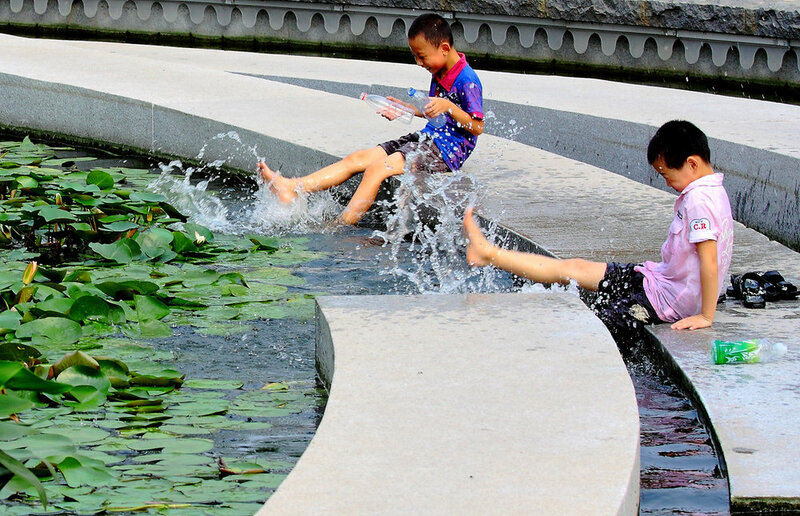 Based on the modern simple style, the reconstruction of Town River and Gudu Harbour is permeated with strong water town style and features everywhere. 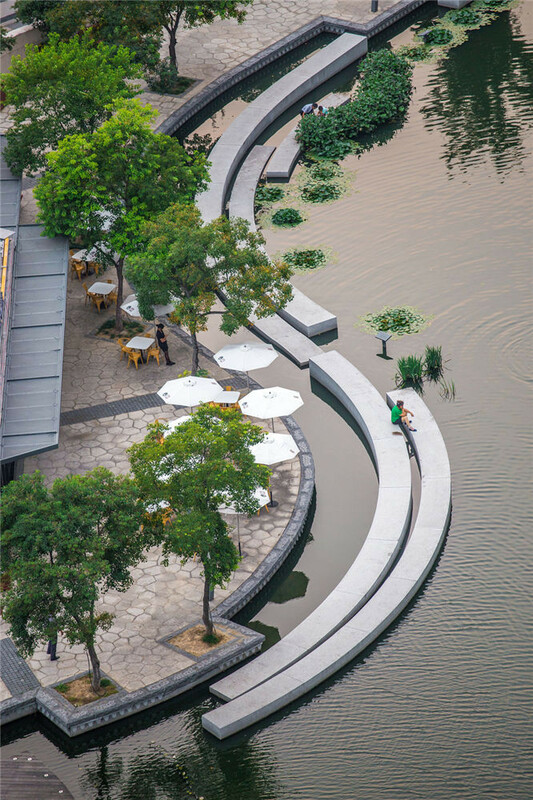 Designer utilises pavilion and wall to deduce the peculiar scenery of south of the Yangtza River---people who lives near river. The most familiar Tsing Lung Bridge for the people of Old Yangshe was repaired. The Tsing Lung Bridge, Longyin, the sound of tide of Gudu Harbour, the Green Fragrant Pavilion, the bamboo raft dock, the ship dock, the Jiyang city wall and the “Eight Forbidden” stela and the eight original cultural elements in the history of Old Yangshe are embellished on the two sides of Gudu Harbour river by creative arrangement to present the waterfront human landscape features of Gudu Harbour. The heartland of the riverside area is the general public places, the landscape design is elegant and modern and utilises boulder strip and granite to create a thick and solid feeling. The landscape bridge is the central link to connect the north and south area of the river so that benefits the daily life of the general public, meanwhile forms a landscape over the river. The design of a centre stage increases the lively atmosphere of the overall city public square, and the design of a waterfront footpath adds a romantic atmosphere to people’s life, what’s more, the cascade design next to the coffee house increases the flow atmosphere to the square, and the 3 meters drop of cascade creates a visual impact and becomes a landscape focal point on the square. The sculpture design on the road corner makes the external public space unified with a theme and forms an integral public outdoor landscape. Meanwhile, the landscape design follows the planning and design of municipal government, bus stations are properly arranged on this area to make it convenient for citizens’ daily life. In the overall landscape and architecture design, we get rid of all the cumbersome notations and keep the most peaceful sense of value, and the Chinese spirit is greater than Chinese elements in the design of this project.